All three films in one Blu-Ray set! X-Men (2000): I love this film, which is a surprise because I absolutely HATED the comic books, cartoons, etc. of the X-Men. The only good thing about the comic book characters were their wild, colorful costumes. And when I saw that they didn't have colorful costumes in the previews, I really thought it was going to be a bust. I saw this film out of curiousity when it came out on home video and was truly blown away by the fact that this is a darn good show! 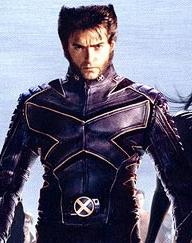 It is a very loose adaptation on the comic books and characters of the X-Men and actually far, far better! I'm glad they made such radical changes. I still wish they had their cool costumes, but I guess you can't have everything. The story is much easier to follow than just about any X-Men comic or cartoon. I never could get a hold of all that cosmic stuff, different dimensions, and death and resurrection of the characters that they have always pushed down our throats in the comics. In this movie, everything they do is within the extreme realm of possiblity. 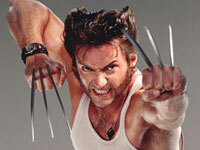 Wolverine is the main character, but is not the short, gruff guy from the comics. Instead, he is around six-feet tall and played very well by Hugh Jackman. 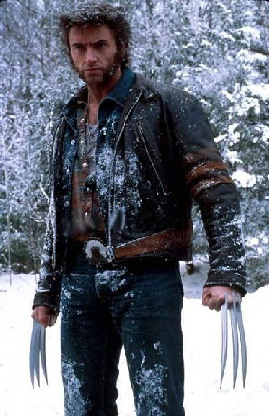 Hugh's Wolverine is hands-down the most interesting character portrayal in the film. He's more human in this film than in the comics. He just happens to have an adamantium steel skeleton and long claws that come out of his hands at will. For some reason, he can heal quickly after being cut or otherwise injured. He doesn't know about his past and it bothers him. Somehow he winds up at Professor Charles Xavier's school for mutants and finds a home with his X-Men. And for some reason, he actually joins them to fight the evil mutant Magneto and his cast of creepy mutant henchmen. The whole cast is great, the heroes and the villains! And it leaves a lot of possibilities for the next film. Even if there hadn't been a second X-Men film, the way they ended the first film was still gratifying. Good triumphed over evil; onto new adventures! X-Men Origins: Wolverine (2009): Excellent movie! To be quite truthful, I wasn't interested when I first heard this film was going to be a prequel. I enjoyed the third X-Men film, "X-Men: The Last Stand", and really wanted to see a Wolverine story move from that point. Hugh Jackman sold this for me. If anyone else had tried to play Wolverine I doubt I would have been as eager to watch it. At this point, NO ONE is going to be able to play Wolverine like Hugh Jackman. He's as key to this character as Clint Eastwood to Dirty Harry, or Paul Hogan to Crocodile Dundee. My only beef is that this movie changed actors of pretty important characters in the series. Liev Schreiber is awesome in this movie as Victor/Sabretooth, but I'm surprised they didn't bring back Tyler Mane. Mane had played the villain in "X-Men" (2000). I also really liked Brian Cox as Stryker in "X2: X-Men United" (2003). He should have reprised his role in this movie...there's no excuse. Danny Huston did a great job as Stryker, but when a film series starts changing its actors, it breaks the reality. Especially in a film series like "X-Men" where continuity is everything. I was more than pleasantly surprised when I found this to be a well-written movie with incredible, non-stop action. It ties pretty well into the continuity of the X-Men films. It answers a lot of questions that were raised in the previous movies. X-Men: First Class (2011): I typically do not like prequels, but this movie is excellent. The cast is nearly different from the original three films, save for a very brief cameo of Hugh Jackman as Wolverine. This movie is great for a number of reasons. It's great to see an origin story for the entire X-Men team because there has never been one. True, bits and pieces of Charles Xavier's backstory and the history of the X-Men team have been dropped here and there in comics and other media, but there has never been a solid origin tale. This story conflicts quite a bit with the comics. For one thing, the original team is different. In the comics, the original team was comprised of Angel, Beast, Cyclops, Iceman, and Marvel Girl (Jean Grey). In this movie, the first X-Men team was a different Angel, Banshee, Beast, Darwin, Havok, and Mystique. The Angel in this movie is a female with insect-like wings. She later goes over to Magneto's side, followed by Mystique. Darwin is killed. Remember, the male Angel was introduced in "X-Men: The Last Stand" (2006). Where all previous movies centered on Wolverine, this film centers on Charles Xavier (Professor X) and Erik Lehnsherr (Magneto). The story chronicles their lives before they met, their friendship and founding of the X-Men team, and their eventual split. Sebastian Shaw is the villain in this movie, along with his henchwoman Emma Frost (White Queen). Emma Frost would later join Magneto. The makers of this film made a major boo-boo when they added Emma Frost to the roster of characters. A character named Emma with diamond-hard skin had already been introduced in "X-Men Origins: Wolverine" (2009). In that movie, Emma was a teenager and the year was 1979. In this movie, Emma is a well-developed twenty-something and the year is 1962. I guess we'll just have to believe these are two different Emmas with diamond-hard skin. A stupid explanation. Besides that, I think January Jones and the whole character of Emma Frost in this film is outstanding. This movie jacks with continuity a bit, and not just with Emma. In "X2" (2003), Hank McCoy is seen briefly on TV without blue fur. In this movie, he gets blue fur in an accident. Also, in "X-Men: The Last Stand" (2006), we saw that Professor X was still able to walk well into middle age. In this movie, Charles was paralyzed by a bullet. Are we to believe Hank McCoy/Beast learned to change from furry to not furry later on in life? And what about Charles Xavier/Professor X? Are we to believe Charles somehow learned to walk again, only to become wheelchair bound once more? "X-Men: First Class" is an awesome movie, but it does things that confuses fans of the series. The climactic battle is set against the backdrop of the Cuban Missile Crisis in 1962. I think the action in this film is outstanding, and I'm very impressed with the performance of Michael Fassbender as Erik Lehnsherr/Magneto. He's one mad, bad dude. Ian McKellen is a tough act to follow as Magneto, but Fassbender did it beautifully. The whole cast is great.